I’m a fantasy writer — of course if I write picture books, they’re going to form a trilogy! Not really. But that’s how it turned out. 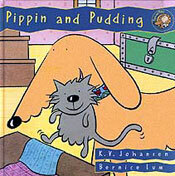 I wrote the three ‘Pippin and Mabel’ books inspired by my dog Pippin, who was a big yellow husky-ish dog. The book-Pippin is female and not husky-ish at all, and lives in a little house near the woods with Mabel, an artist. Whether it’s fleeing up hill and down dale to avoid a bath or discovering things like kittens and mysterious bones in the woods, Pippin always keeps Mabel’s life from being boring. They came out in 1999, 2000, and 2001. 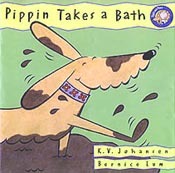 I received a Lieutenant-Governor’s Early Childhood Literacy Award (now renamed the Dr. Marilyn Trenholme Counsell Early Childhood Literacy Award) in 2000 for Pippin Takes a Bath. The real Pippin really did dig up my tomato plants to bury a bone and carefully put them back into place and pat down the earth so I wouldn’t notice. Unfortunately he wasn’t a botonist and got which end up a tomato plant should go wrong. All the roots sticking up in the air was a bit of a giveaway. And he also really found and claimed a stray cat, whom we adopted — thought that was after I wrote Pippin and Pudding. He never found a Mastondon, though. My novel Blackdog is dedicated to Pippin. 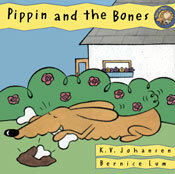 The three Pippin books were illustrated by Bernice Lum. French translations (translated by Cecile Gagnon) were published by Scholastic. This entry was posted in dogs, Twenty Years of Books, Writing and tagged dogs, mastodon, picture books, Pippin and Mabel books, Pippin books. Bookmark the permalink.